Olive Green, green and hazel cosmetic design. Cosmetic lenses are sold only in the color ordered, there are no modifications of the colors allowed on these designs. 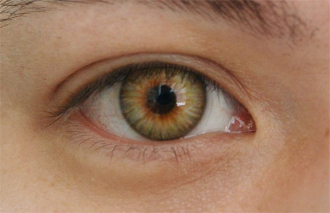 Cosmetic colored contact lenses look their best in natural lighting. Some artificial lighting can cause the colors to appear dramatically different than shown.